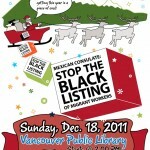 » Home » Past Events » Event: Stop the Black Listing! Join us to write Christmas wish letters and ask Santa for migrant workers’ respect and dignity, and to demand that the Mexican Consulate stop the blacklisting. Organized by the United Food and Commercial Workers (UFCW) and the Agriculture Workers Alliance (AWA), with support from the Coalition for Migrant Workers’ Justice.